The Russian Air and Space Force (VKS) deployed four Sukhoi Su-57 fifth-generation fighters, developed under the PAK-FA (Perspective Aviation Complex of the Frontal Aviation) program, to the Khmeimeem AFB in Latakia. The deployment came shortly before the Syrian army launched a major offensive in Ghuta, the last remaining rebel-held stronghold in the Damascus countryside. One pair arrived on February 21 and the second on February 23, the last move timed to coincide with the centennial anniversary of the Red Army. Moscow confirmed that the Su-57s have arrived in the war theater for “operational and combat trials,” but did not elaborate any further. Apparently, the VKS is in a hurry to test its newest and most advanced combat jet in a real war environment before the army of the incumbent president Bashar Al-Assad potentially crushes the remaining points of resistance west of the Euphrates riverbank. During the seven years since the type’s maiden flight, 10 operable examples have flown, the last one on Dec. 23, 2017. Around that time, Boris Obnosov, general director at the Tactical Missile Corporation, said that the company had developed six new missile types especially for the Su-57, and was going to add six more by 2020. All those are shaped to fit into the aircraft’s internal weapons bays, which consist of two in the wings for short-range air-to-air missiles and two inside the fuselage measuring 16.4 feet (5 meters) in length for payloads of up to 2,200 pounds (1,000 kg) each. The aircraft also has six external hard-points for weapons. Presumably, the Su-57 pilots in Syria would exploit an opportunity to use the Kh-38 air-to-surface missile developed as a replacement for the long-serving Kh-25 family, so far the only one of the self-propelled air-launched munitions developed for the type that has been accepted into service. More recently, the Tactical Missile Corporation unveiled the Grom series of glide bombs, and they might see action in Syria, too. The Su-57s might also employ older-generation KAB-250, KAB-500 and KAB-1500 guided bombs with laser, TV, thermal imager, and satellite-aided seekers, which are already in use in the theater on Su-35Ss, Su-30SMs, Su-25SM3s, Su-24Ms and MiG-29SMTs. 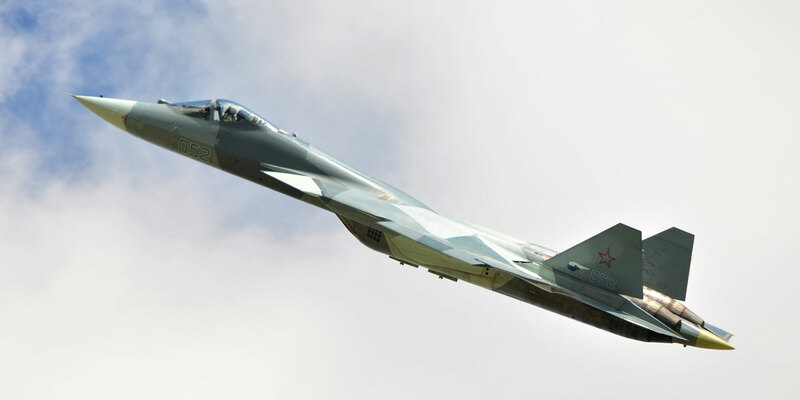 It is also believed that by fielding the Su-57, the VKS seeks to supplement the Su-35S and Su-30SM fourth-generation fighters on air patrols in Syrian airspace, whose stated purpose is to defend strike aircraft against U.S.-led coalition fighters after a Turkish air force F-16C downed a Russian Su-24M in 2015 and a U.S. Navy F/A-18E destroyed a Syrian air force Su-22M4 in 2017, in both cases with Sidewinder AIM-9X air-to-air missiles. Last year, there were a number of close calls involving Russian and U.S. aircraft, including a confrontation between an Su-35S and F-22A Raptor over the Euphrates river. The low-observable, supercruise-capable Su-57 may prove a more difficult opponent than the Su-35S, the best of Russian fighters previously deployed to Syria. The newer type is more suitable for an intended role of “shooter” using targeting fed by the older generation fighters, A-50U AWACS, and the ground radar network. Apart from the standard R-77 missiles—similar in performance to the Raytheon AIM-120—the Su-57 (as well as Su-35S) can potentially employ a newly developed scramjet version of it, as well as the heavier R-37 and other longer-range air-to-air missiles.